Best Friend Stories. 41/52. 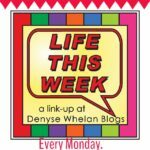 #LifeThisWeek. 2018.102. I have always envied those who can keep a long-time friendship going, claiming best friends from school days and more. I reviewed some photos of mine before writing and i can see, in my case, why this is not so. I would not like to think I am a bad friend but I do agree that over time friendships change and move on. 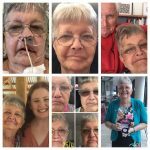 In the most recent years I let a friendship slide – we had moved away from Sydney – as my anxiety grew and I knew I was not able to travel back to see this friend. Nevertheless, I did make contact after a year, and she happily caught me up and I felt a sort of re-connection. Then I got cancer. She is not on social media and to be honest, maintaining friendships was not high on my priority in recovery and beyond. Nevertheless, knowing I was risking being rejected I wrote her an email, letting her know of my health status and that, for the present, I could probably meet up in Sydney again for a coffee. We met up for coffee over many years. No response. Nothing. I suspect, I did leave it too late but I also know I did something to offer the hand of friendship again. Chronological Order of Best Friends. Dad tells me I had imaginary friends at this age. I think one was called Pinky. I do not remember but I believe him. I am off to the Dapto Show with my Aunty. Didn’t I dress well then? I am in second row from the bottom, 2nd in from the right. I am next to my best friend at Gwynneville P.S. in Wollongong: Helen. We played outside school hours and went to each other’s houses. She and I competed, along with Warwick, in front row, second in from left, for first, second and third place in class. Check the class numbers people! We stayed in touch via letters and some visits when we had moved to Sydney at the end of this year. I do know, amongst the trivia in my head, that her birthday is 27 September. It would be untruthful to say anyone here was a BEST friend but some were indeed friends. 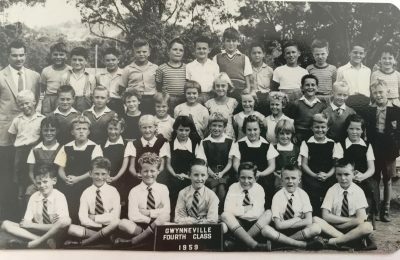 I am 3rd from left in front, and my friend, who also came to the same high school as me in 1962, is first on the left front row. 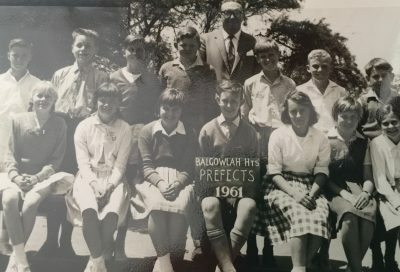 We were passing acquaintances once we chose our subjects for the ‘new H.S.C.’ and saw each other (and sang together) on the school bus from Balgowlah Hts to Brookvale where our High School was. I went my way to teachers’ college and teaching as she went her way to Uni and became an architect. Our parents still lived in the same suburb and saw each other as ‘waving’ aquaintances I guess. 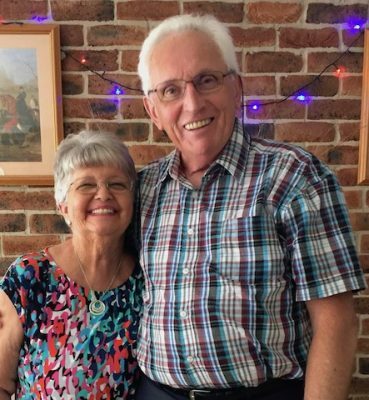 Then, with the era of Facebook, we found each other in the past 5 years…and guess what, we had been living relatively close to each other in the Hills District of Sydney for decades! We met up before we left Sydney and I love her memory about all things where I lived because she was there from birth. It’s a great connection and I know her birthday too. She is 1 month and 5 days older than me. Ann. 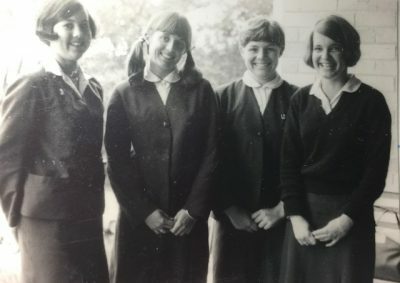 Last year of High School – 1967. I am far right. We were ‘besties’ in the senior years of High School. It became apparent though, that I was the one who needed to buckle down and study in that final year as I really wanted to a tertiary education to become a teacher. My friends had boyfriends then that each married. About 2-3 years out of school, and they trained in secretarial work. We went to each other’s weddings (I think!) and they came to ours. 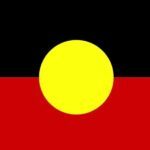 From time to time, when we returned to Sydney for school holidays we had a catch up but I could already see my social world as a country-side teacher was not in keeping with theirs. 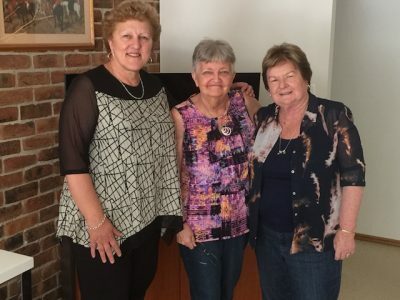 Many years later, via a social media forum I think, we did have a reunion of sorts and even more recently my Dad saw Julie (on the left) being a personal home carer to someone in his retirement place. She said “Are you Mr Simpson, Denyse’s Dad?” That is one good memory. No, we have not met up. Julie, Sue, Pauline. As teachers, much of our social life is connected where we are teaching. We had friends in each of the country towns and when we moved back to Sydney, we continued seeing people once a year. I had female friendships groups at school and always enjoyed the connections. Once I became a Deputy Principal then Principal, I moved into more work-related social networks. However, after my health breakdown as a principal, I eventually went to teach in a friend’s school and had a kind and lovely relationship with two of the administration ladies. These ladies stayed in touch when we left Sydney and after my cancer diagnosis and surgeries arranged to come and visit. This is just lovely. We still do keep in touch via social media due to distance. Luisa and Marg. But the one person who keeps top status as my best friend is this man. The one I married. Just for something different, a photo of me with him in late 2016 before cancer. So, what are your best friend stories? Next Week’s Optional Prompt: 42/52. What I Have Learned Lately. 15/10/18. I’ve never really had a true best friend – I’m lucky I still have a lot of good friends from school, uni and work. Since leaving work, my friendship base has shifted and I now have a close group of friends with similar interests and hobbies. I feel blessed to have people I can count on, although I don’t have a true best friend, per se. I think I had more friends as a mum of kids at school too. It ebbs and flows but you have done well to be in relatively the same geographic area which helps maintain contact. 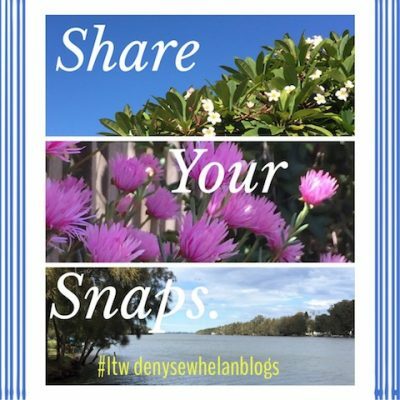 We moved around NSW and then into 3 different suburbs in Sydney. 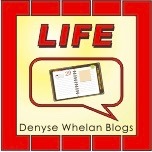 Now look what happens with blogging, we can catch up! I have good friends from grade 6, long time pen friends, friends met during my travels, and friends from work. 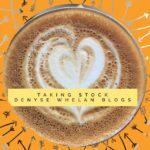 It would be wonderful to make new blogging friends and meet IRL, too. That sounds really good for you and friendships Natalie. 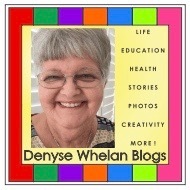 I have loved meeting bloggers over the years. I have been fortunate enough to meet many. The thing is, no small talk needed, you already know about each other. Thank you Debbie, I am pleased you find this interesting. 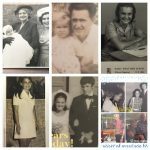 One reason I blog more personally now is it helps me get stories out there and I think they can be a lasting legacy for my family. The ones of my cancer and Telling My Story, I print out and keep in a folder. Hope grandmothering continues to go well. Awww I like the hubby one the best. My husband is definitely my best friend too! I reckon we both chose right that they are our besties!! I like your best friend stories – I think the thread that runs through them is that you seem to be good at making friends, even when old ones have drifted away. I don’t find making friends easily at all, and I tend to want to get out of social situations as soon as possible. So I suspect my lack of friends is my own fault, but I’ve found lots of great friends online, which helps. I seem to recall back in the early days of your expat life in SF you were on-line saying how long you could delay going to a meet-up. I still get a bit anxious but if I am motivated and interested enough I will do it. I love that we are on-line friends! Hahaha, I’ve still only been to that meet up once. It was great, but I’m awkward to a fault. 🙂 I’m also very glad that we are online friends! I feel like you have a way better memory than I do haha. Or I’ve moved too many times in my life. I’m in Facebook contact with a lot of people from over the years but in person, a few of us try to meet up once or twice a year to have a long lunch and catch up. I have always had that kind of memory for trivia. 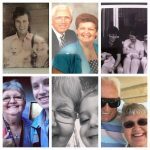 Birthdays, boyfriends’ names, places I have lived and everything do to with the grandkids! That sounds cool that you have people you catch up with like that. 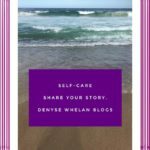 I have several friends Denyse, and they have chopped and changed throughout my life – I’ve never really had a BFF – it just doesn’t seem to be part of my life to commit to another female on that level. I agree about husbands though – what would we do without the love and support of a good man? Exactly. I did have good friends and I like that you can have a coffee and a catch up with those friends but there is no-one like the bloke you married! I like that your husband is your best friend! Oh thank you for including that one too Min. I shall read it. Yes, I have never been one to want to go on girls’ weekends etc. I see that I am not alone there. I do love a lunch or a coffee catch up though. I am pretty sure you do too. It’s hard to keep us so many relationships, I think. Especially when you are married and make that a priority. I am lucky to have a couple of long standing friendships, but luckily they are understanding about the distance. Yes that makes a lot of sense Jodie. I also know that when i left teaching most of those people were still teaching and so catch ups had to be in school holidays to suit them. I have, over the years, done my bit to maintain long distance friendships but they do wane over time. I’ve had a few best friends over the years, most I’m no longer in contact with but there’s one special friend who I consider my ‘chosen sister’. We’ve had ups and downs over the years and there was a while were we didn’t speak (neither of us know why now) but she is one of the most special people in my life. Hubby and I were also best friends before we were together, so he’s a long standing bestie. I love your photo of you guys, it’s so good being friends as well as spouses. I am glad you ‘made up’ and have each other back in your lives. I am sure as a busy mum of 4 that it would be very hard to make arrangements to see friends regularly. Love that James has been and continues to be your bestie! We are lucky. 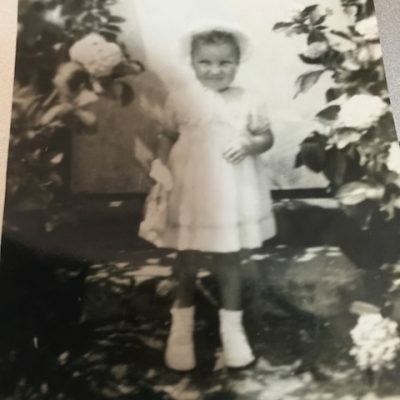 I remember that photo as our granddaughter took it…of course, we had no idea what lay ahead in the 6 months following but there I look (and felt) happy! You’re looking so happy and healthy in that last picture which is great to see. Great friendships last the test of time apart. I see some of my friends only once every couple of years but it’s always as if no time has passed when we do catch up. I know I do don’t I? Pity it was in 6 months after that I would find out I had cancer behind that smile. It was a great day with our older grandkids and my now 21 yo granddaughter took this. I love it. I have had many friends come and go too. I do have one friend who I have caught up with regularly although not often since high school. I wish I had the time and money to catch up with her more. Such beautiful memories. Looking back and reliving some moments is always so nostalgic and fun.Thanks for sharing your friends with us. Thank you, you do wonder where the time went writing like this!